The Consumer Protection Council (CPC) and the National Agency for Food and Drug Administration and Control (NAFDAC) shut down the Victoria Island branch of Krispy Kreme on Wednesday. 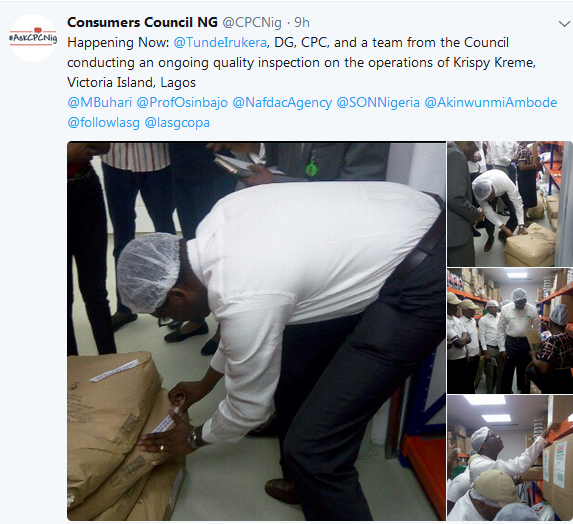 The CPC shared the news on their Twitter page, revealing that they, together with NAFDAC, conducted a quality inspection on the products, facilities and operations of the doughnut shop. Director General of the CPC, Tunde Irukera, was part of the team on the scene. The team discovered that the raw materials used by the confectionery are past their expiry dates. See photos from the inspection.